A kilo of broccoli only contains 240 calories and 2 gramms of fat, so it's ideal for almost any diets. It also contains 33g of protein, 21g of carbohydrates and it's rich in folic acid, so consuming broccoli during pregnancy, after labour and whilst breast feeding, is a great idea. 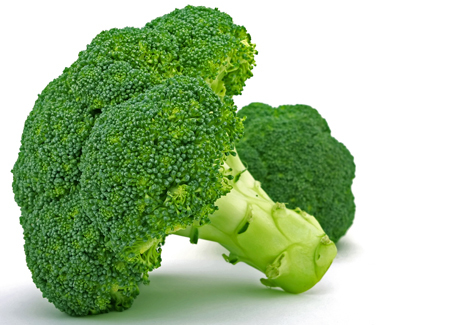 Eating broccoli is revitalizing - it's iron and vitamin-C content can boost your fat-metabolism. Note: Don't consume broccoli with creamy- or cheesy dipping, nor deep-fried, because that will only increase your weight. Tear the broccoli flower to pieces and boil them in hot water for 2-3 minutes. Pour the water from the broccoli and leave them dripping. Take a pan and roast the mandel- and the peanut flakes until they get golden-brown coloured, then put them into a little plastic pot to cool.